At Kelly Insurance Group we are an independent agency, which means that our allegiance is to our customers. Having access to numerous carriers we can ensure we are placing your business with the carrier that provides the best coverage possible at the most competitive price. If you cannot find what you are looking for, or maybe you just want to discuss your current coverage, please contact us. Founded in Millvale, PA in July, 1957, our roots can be traced back to the late 19th century. W.A. 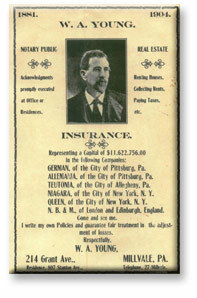 Young was an insurance agent with an office on Grant Avenue in downtown Pittsburgh, which he founded in 1881 (see picture to right). Mr. Young then sold his agency to Millvale resident, H.H Dixon in 1904. Mr. Dixon passed the agency to his son R.C. Dixon, who eventually sold the agency to our agency's founder Franklin B. Kelly. 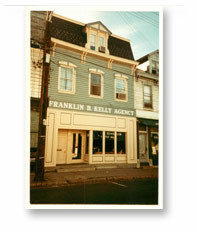 After the death of Franklin B. Kelly in the late 1980s, D. Jeffrey Kelly, the current owner, formally changed the name of the business to Kelly Insurance Group, Inc. In 2003, the business moved from Millvale to the North Side where they currently do business. The additional pictures to the right show some of the offices where the Agency has conducted business throughout the years. If you are familiar with the town of Millvale the names, pictures, and buildings may look familiar. The history of our agency would not have been made possible without the loyalty of our customers, our most valuable asset.